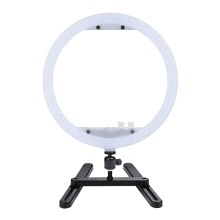 Dimmable 14" LED ring light with built-in 240pcs LED beads, perfect for live broadcast, selfie & make up, etc. With RGB multicolor lighting, brightness dimmable and color-temperature adjustable, you can find the optimal lighting effect at ease, very convenient and easy to use. Dimmable 14" LED ring light with built-in 240pcs LED beads, bright enough, providing good lighting effect. Support RGB multicolor light mode(colors switchable), warm light mode, white light mode and neutral light mode to meet your different using needs. Brightness dimmable and color-temperature adjustable, you can find the optimal lighting effect at ease. Ring-shaped appearance design can make sure the light is softer and much more uniform. Easy to install, it can be mounted on light stand(not included) or table stand(included). Comes with mobile bracket for convenient smartphone mounting. Perfect fill-in light for taking selfies, live broadcast, daily makeup, beauty & nail salon, etc.